Recently the host of BarterScoop Insiders Circle’s Podcast Marlon Burns had the opportunity to sit down and talk barter with the ladies of Never Broke Nation. A great podcast and Youtube series that teach and inspire people to make, save and grow their money. As a guest, he was able to answer and cover some of their most pressing questions regarding the world of bartering. Ranging from how to barter on Facebook, why barter is the fastest growing category on Craigslist to how the IRS views barter related transactions. Never Broke Nation started in 2016 with a series of entertaining and informative videos, that primarily focuses on all things FINANCE! “Sitting down with three of the five host Tini, Chris and Alicia was a great opportunity to help bridge the world of bartering and finance. Plus, I’m a huge fan of their show and was delighted to accept the invite”, said Marlon. Incorporating barter into your financial plans can give you tremendous advantage. When people think of barter, they think of chicken for goats or its just for poor people. However, bartering is the oldest form of trade, and with the right strategies in place, it could help you reach your financial goals faster. “If bartering is not a part of your financial strategy, then you’re missing out on a huge opportunity. 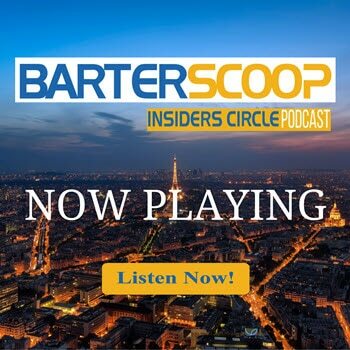 On BarterScoop Insiders Circle’s Podcast, we focus on informing and educating people on the possibility of barter in their personal and business life”, he added. Check out Marlon’s interview on Never Broke Nation by clicking the link below.